Are you a writer? Are you on Pinterest? These Pinterest tips for writers and bloggers will help you find new readers and help you market your writing! Pinterest is one of the fastest growing visual social networks and can be a great way to reach your audience for your book. It’s not surprising that it’s quickly becoming a favorite marketing platform for authors to reach a wider audience for their work. 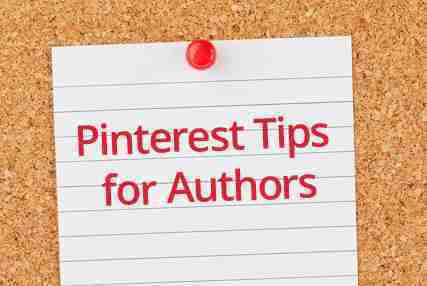 Here we’ve put together 10 tips for authors to use Pinterest effectively to market your book. Pinterest organizes all the pins into boards. You can create your boards to reflect any category you’d like. We recommend creating larger boards that have a minimum of 100 pins on them. Think about your target audience – what interests them? Without followers, no one will see the great Pinterest content you’re posting. Follow your fellow authors and find friends via Facebook. This helps you get in front of a broader audience. You can also add a Pinterest button on your website that can attract more followers. If you’ve used Pinterest for any short amount of time, you’ve likely noticed that quotes are quite the popular topic on Pinterest! As an author, it is a good idea to make sure you have a board specifically for quotes. Once you have that, create some images with quotes from your book or from your blog. Make sure when you upload the quote image that you link the quote to your author website or book sales page. This will help pique people’s interest, as well as help you build name recognition the more people see your quotes. There are a number of free online apps that can help you create images with quotes you can pin to Pinterest, or you can try making your own in a photo editing program. Some examples of these apps include Canva and Adobe Spark. If you are writing really good blog posts, you’ll want to make sure you use an enticing image for the post and pin the blog post to your Pinterest board. Images should be at least 600 pixels big to show the best and have the greatest click through rates. Make your most important boards visible “above the fold” – at the very top of the page. A user should not need to scroll down your page to see your most important work! This is what people will see first when they visit your Pinterest profile. Be sure too that each board has a nice cover photo that encourages people to want to follow it. You’ll definitely want to make sure you include your Pinterest link on your website in addition to any other social network icons such as Facebook or Twitter. If you have a business account, you can also include widgets on your sidebar or at the bottom of your posts that feature pins from your favorite boards. Write about who you are, what you do, and of course link to your blog or website. Make sure you use the same profile image you use across other social media platforms as that will help people to recognize you more easily. Be sure that you use words relevant to the topics you write about, as this will help increase the odds your profile and boards will appear in Pinterest search results. You should visit Pinterest and pin at least 5-10 new things each week at a bare minimum. Try to add new fresh content from the web, not just repins of things you’ve found on Pinterest already. Be careful not to overload your visitors with too many pins all at once – this can be overwhelming or annoying to your followers. Don’t pin every single thing you see – actually take the time to click through the pin to see what it links to and make sure it provides value to your readers and followers. It is also a good idea to write your own comments and descriptions about the different things you pin, as it shows your audience why it is “pin-worthy”. If you convert your account to a business account, which is easy to do on the website, you will be able to see a number of stats and information about the content you’re pinning. You can also check to see what pins are the most popular from your website. This will help you identify better with your target market as well as to create more content that appeals to your readers. By understanding what your readers enjoy reading, you will be able to create content and write new blog posts on your website that will make them excited to keep returning for more! Pinterest can be a great way to connect with a broad audience for your website or book. Do you have any Pinterest tips for authors you’d like to share? We’d love to hear them in the comments section below!